One of my earliest memories is of splashing in the water along the edge of our rental property in north-central Utah and making a serious 2-year old’s attempt to hunt a frog with a stick. Not really sure how it happened but I somehow got at least one because I saved it in a bucket by the front door. Mom had me turn it loose, after letting me observe my trophy-in-a-bucket the rest of the morning. That early exposure and interaction with nature has been demonstrated by research and experience to be vitally important in developing a conservation ethic and a basic connection with nature and, for some, becoming a hunter. From those humble beginnings as a frog chaser, exploring nature’s lessons and secrets became second nature. Some experiences registered powerful impacts, emotionally reinforcing my personal connection. During late elementary and early junior-high school years, I was introduced to Myakka River State Park in southwestern Florida, a special place that became my happy place and sealed my connection with nature. One of Florida’s oldest parks, it encompasses a diversity of outdoor opportunities. Five cabins, built from palm logs in the 1930s by the Civilian Conservation Corp still exist and can be rented. Today, it’s one of the state’s largest parks, with the Myakka River running through 58 square miles of “…wetlands, prairies, hammocks and pinelands.” Back in the day, the park was smaller but everywhere you turned there was something to capture your heart. I remember our first stay in one of those cabins. Mom decided to enjoy an afternoon nap. Being a 9-year old, I was bored and couldn’t figure out why anyone would sleep in a place like this. Sitting in the screened-in porch, I entertained myself by having a conversation with the ravens overhead. They called and I called, trying to mimic their caws and cadence. In my young mind, I was impressed that I could talk with wildlife. Imagine my delight when decades later I discovered you actually could communicate with wild animals. I thought it would be even better if I could get close to a wild critter. The frisky squirrels were my target. They loved the small handouts I tossed them. It thought that if I could lure one onto the screened porch, we could be friends. A slice of bread, torn into pieces and tossed closer to the screened door with each offering, worked until the squirrel reached the doorstep where he hung up. So I tossed him a piece twice the size of the previous offerings. He hopped onto the porch and I slammed the door. That little bugger went bal-lis-tic. He jumped into the air, claws bared and eyes bulging. He slammed into the screen to his left then shot all the way across the floor to the right with the horsepower of an Indy racer. Thank heaven the door leading into the main cabin was closed. Somehow I stayed out of his way during his less-than-friendly reaction to my hospitality. I launched myself at the screened door, holding it open until he shot through it, hit the ground and ran. Have to say, I learned a lot during that little exercise. On its own, Myakka was a universe of wonder. Every corner held bugs, worms, snakes, birds and butterflies. The lake and river had frogs, tadpoles, fish and wading birds but, more intriguingly, gave up glimpses of gators and eagles. Trails led to sightings of deer and wild hogs. Every day built lasting bridges between my soul and nature. "Hunters are born with an innate sense of belonging to a larger, natural world where life is interconnected—where man uses his abilities to create balance and maintain this all-important nature connection." On our second trip, our family became friends with the park superintendent, Mr. Crowley, and the head ranger, Wayne—ideal influences for a young would-be hunter who had no family members who hunted. They took us places that no other park visitors ever saw. We traveled the back roads in an open-top Jeep, poking into the depths of the forest and swamps with a powerful spotlight. We saw red-eyed deer, green-eyed gators, raccoons, armadillos and wild pigs. Crowley was a naturalist by training who constantly revealed the interconnections of life, the relationship between predator and prey and nature’s way of balancing it all. There weren’t many bears in the park then but there were pigs and some wild boars. We learned about their history at the park’s small museum. Like now, they caused problems. Managing their numbers fell to Mr. Crowley, and on one hunt we got to tag along. Mom, me, big brother and little sister all piled into the old Jeep with Mr. Crowley, Wayne and their dogs. We drove on two-track, sandy roads through pine-tree stands and choked palmetto hammocks. Eventually, we came to areas that were thinned out. Then Wayne yelled, “Pigs!” pointing in the distance. The Jeep stopped as we stood up to look. Then Wayne shouted something to the dogs and they ran for the pigs. We watched as the dogs closed in on the sow and her half-grown yearlings squealing across the prairie. Crowley and Wayne uttered instructions. “No, No, not the big one!” “Yeah, that’s the one, the one with black spots, get it, get it.” And they did. Then to my amazement, Wayne’s boxer grabbed the pig by the ear and brought the pig down to the ground with her. Our hosts let out adrenaline-packed whoops, grabbed some rope and ran to the dog and the pinned-down pig. They made quick work of hog-tying it then they hauled that spotted pig—very much alive—into the back of the Jeep with us kids. I touched it and watched it breathe. The next day our crew had the best pork barbeque imaginable. The following week, after we returned home, I had my first taste of wild game tenderloin. There were many other things Crowley shared with us during visits to Myakka. On one occasion, he stopped next to a palm tree along the road, flexed his arms and said, “Superman,” and used his hand to push over a 30-40-foot palm tree. Then he asked if we liked root beer. He took out his pocket knife and cut out a little cone of dirt around a small plant, lifted it to our noses and said, “Smell. Root beer.” I was intrigued. On another visit Wayne asked if I’d like to ride with him to the park marina. He’d received reports of gator activity. As we drove into the parking lot, several pigs raced through the headlights. Wayne hit the spotlight. There were a few gators in the inlet. At the water’s edge, we saw a pig floating. Wayne examined it, dragging it back to the truck. Its whole mid-section was gone. “Guess the gators have to eat too, right?” He explained it wasn’t wise to leave the carcass near the marina and store, though gators killing pigs was a natural part of the system. Mom wasn’t a hunter but she wasn’t against hunting. She was a teacher who understood how many important lessons awaited me in the park. I am forever grateful for that and for growing up in a place where I could discover nature. As with so many youngsters, those connections evolved into an interest in hunting. After five decades of both personal and professional interaction with hunters and hunting, I submit that hunters are not born to “kill” animals. 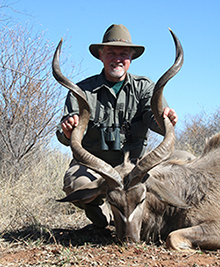 Hunters are born with an innate sense of belonging to a larger, natural world where life is interconnected—where man uses his abilities to create balance and maintain this all-important nature connection. I was already interested in the land and in wildlife before I experienced Myakka. But Myakka, Mom, Mr. Crowley and Ranger Wayne took the time to expose me to the best theme park ever. They set the foundation for the development of a conservation ethic and for a humbling and spiritually-enriched existence—a life that embraces a hunting heritage that gives deeper meaning to life.